Clarins Beauty Flash Balm: My holy grail primer. This product plumps, brightens, moisturises, tightens, soothes and smooths my skin, preparing it for whatever foundation I want to use next. It is also great on no makeup days to make me look like I've had a full night's sleep, banishing signs of fatigue and it also works great as a mask. I couldn't even hazard a guess at how many tubes of this I have used over the years. If you haven't tried it yet, you need to! 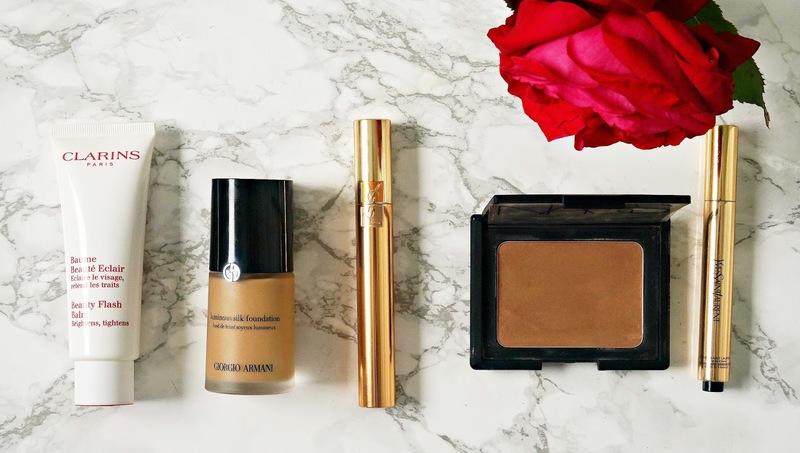 Giorgio Armani Luminous Silk Foundation: Armani Hydra Glow was my favourite foundation of all time and when that was discontinued (don't you just hate when brands do that? ), I moved on to Luminous Silk and it has been a staple in my collection for around 10 years now. This foundation is oil-free but isn't at all drying on my skin. It gives medium coverage but is buildable without being cakey. It is long-lasting and glides over pores without highlighting them and it is SPF-free so perfect for nights out/flash photography. It doesn't feel heavy on the skin and although the finish isn't as dewy as I usually like, it has a certain luminosity that I think would appeal to most. Nars Laguna Bronzing Powder: Another product that I've used for around 10 years! The texture of this bronzer is silky smooth and the colour is perfect for both bronzing and contouring - not too grey but not too orange either. The texture of this bronzer makes my skin look smooth and it doesn't go patchy or break down at all. I also love to use it on my eyes when I'm short on time but still want to look put together. YSL Touche Éclat: The original highlighting, under eye brightener, that is often copied but never quite equaled, in my opinion. I love this product because it is very lightweight in texture so it won't settle into any fine lines, it doesn't crease (on me anyway!) and it really does a great job at brightening my under eye area without looking too obvious. I don't have terribly dark circles but if you do, a little bit of corrector before this and you would be good to go. Oh and, of course, I love the classic gold YSL packaging! YSL Faux Cils: Every mascara I have ever tried, or will try in the future, is compared to this one. I like dramatic, voluminous lashes that don't smudge or flake, are very black and are not crispy and this mascara ticks every single one of those boxes! I am regularly asked what mascara I am wearing because the effect is as close to the false lash look that you can get and my naturally pathetic lashes are instantly transformed when I wear this mascara. I would love to know what your most repurchased makeup items are? Have you tried any of the products I have mentioned here today? I'd love to hear in the comments below!